Sophomore guard Jair Bolden dribbles past a Davidson defender during a men's basketball game at the Smith Center Saturday. Men’s basketball was handed its worst loss of the season in a rematch against Davidson at the Smith Center Saturday afternoon. Despite heading into the halftime break with 12 more points than they did against the Wildcats last time around, the Colonials (9-14, 2-8 A-10) were unable to hold back a second-half Davidson (12-9, 7-3 A-10) offense – ultimately losing 87–58. Only one Colonials player ended the night in double-figures. Senior guard Yuta Watanabe collected 20 points and four rebounds on 7-for-17 shooting. The next highest GW scorer was graduate student Patrick Steeves with seven points. The Wildcats were led by freshman guard Kellan Grady – who scored 23 points and secured eight rebounds. Joseph went with a four-guard lineup to match up against Davidson’s spread-out attack, stacking its backcourt with Watanabe, sophomore guard Jair Bolden, freshman guard Terry Nolan, Jr. and freshman guard Justin Mazzulla. GW’s smaller lineup ended the night shooting 40.4 percent from the field and was outrebounded 38-26 on the glass. “They’re not a big tough rebounding team but we also took a lot of bad quick shots that led to them getting a lot of rebounds,” Joseph said. Nolan opened the night with a quick three-point shot to give GW the upper hand but Davidson answered back with a two of their own. 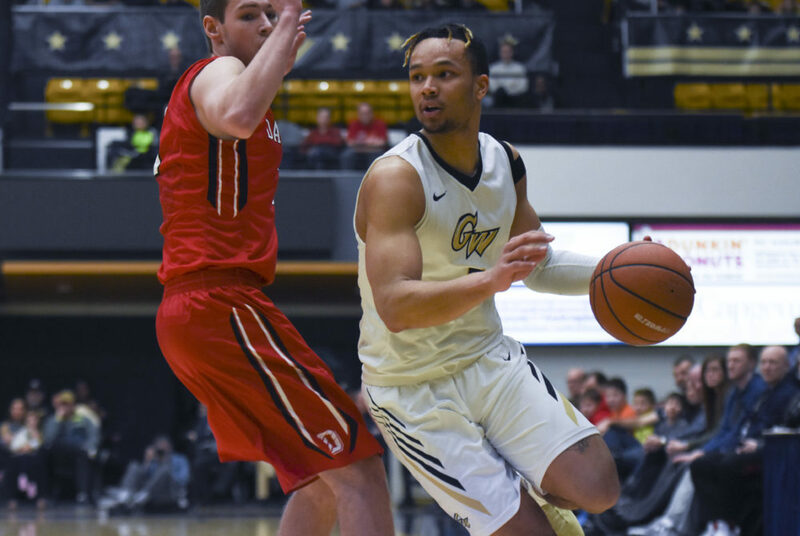 After trading baskets with the Colonials for the first 14 minutes of the game, the Wildcats shook off GW’s defense and a layup from Davidson senior forward Peyton Aldridge pushed his team’s lead to four and sparked a scoring run. The Colonials went into the locker room trailing 41–29. After the first half, the Wildcats were shooting 47.1 percent from the field and had gone 7-for-16 from beyond the arc. GW was shooting at a 43.3 percent clip from the field but had only garnered three makes from three-point range. Coming of the gate in the second half, Grady and Aldridge both drained threes in the opening minutes of the frame. Aldridge, who leads Davidson with an average 20.0 points per game, was held to just five points on 2-of-6 shooting and two rebounds at the half and ended the night with 13 points and six rebounds. During the following minutes the scoring for both teams slowed down, and the Colonials missed seven-straight shots at one point in the middle of the second frame. In the final three minutes of the game, after Nolan fouled out, Joseph emptied his bench. Senior guard Jack Granger, sophomore forward Luke Sasser and freshman forward Javier Langarica all saw minutes near the end of the contest. Langarica picked up seven points and knocked down his first career three-point basket in the game. The Colonials return to action Wednesday night when they take on La Salle (10-13, 4-6 A-10) at the Smith Center. Tip-off is scheduled for 7 p.m.